On the heels of Windows 8.1 announcements, the Windows 8 operating system is just starting to make moves as the new third most popular operating system. 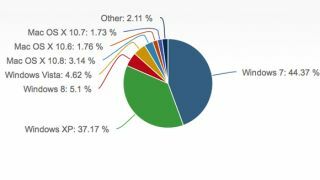 Windows 8 had 5.1 percent of all desktop OS web traffic in June, beating Vista for the first time, according to web analytics firm Net Applications. Windows Vista saw a smaller 4.62 percent of traffic that same month. The OS' positions were switched in May when the W8 numbers sat at 4.27 percent, edged out by Vista's 4.51 percent of web traffic. Interestingly, both operating systems gained market share between the months of May and June. A further feather in the cap of Windows 8 is the fact that Microsoft today revealed its Windows Store has now passed 100,000 apps, a feat the company said it was close to last week during Build 2013. Of course, the Net Applications report points out that Microsoft's 8-month-old operating system still has a way to go before it matches the likes of Windows 7 and Windows XP. Predecessor Windows 7 took home the crown in June with 44.37 percent of web traffic, and age-old Windows XP proved its resilience with 37.17 percent. Combined, Net Applications' numbers show a steady 91.51 market share for all Windows operating systems. Windows 8 is making small strides, leaving behind other, less popular operating systems. Lumped into an "Other" category at 2.11 percent are Linux and older Windows and Apple platforms like Windows 98 and Mac OS X 10.5 and below. Behind them are more recent Apple operating systems, Mac OS X 10.6 at 1.76 percent, OS X 10.7 at 1.73 percent and the most recent OS X 10.8 completing the pie at Pie, 3.14 percent. To be fair, since Apple's operating system is refreshed yearly, Mac OS X stood its ground at a more respectable 7.2 combined market share.